When you think of truck-driving country classics, the names of four artists should come readily to mind: Dave Dudley, Red Sovine, Red Simpson … and The Willis Brothers! Brotherly harmonies + offbeat humor + trucker tales = a winning sound and track record. “Give Me Forty Acres (To Turn This Rig Around)” would put The Willis Brothers on the musical map in 1964 with a Top 10 Country hit that would go all the way to #1 in Canada. An album of the same name with a pronounced truck-driving theme would follow in 1965, as well as another in 1967 Travelin’ & Truck Driver Hits (recycled + new tracks) plus one last stellar effort Hey Mister Truck Driver! in 1968. “[Suzanne] Mathis [graphic designer co-responsible for Starday truck driving covers], like many others, got her job at Starday through her neighbor and accordionist, Vic Willis. The youngest of the Grand Ole Opry’s Willis Brothers trio, John ‘Vic’ Willis was both a recording artist and a song scout for Starday throughout the mid-sixties. He was also a career counselor on the side. He convinced [Starday head, Don] Pierce to employ several of his friends and at one point he even had Shot Jackson’s daughter, Arlene, and three of the Willis Brothers’ wives working at Starday. Two Willis Brothers “non-truck driving” albums would yield a pair of classic diesel tracks – “Soft Shoulders, Dangerous Curves” from 1966’s Goin’ South and “Drivin’s In My Blood” from (previously-mentioned) 1968 LP Bob. Zero to 180 couldn’t take it any more, so it added a new category – steel guitar – and instantly populated a set of 25 pieces from the past three years that feature many of the world’s foremost steel guitarists, including today’s post, which is the first to highlight the work of Leon McAuliffe, one of the first players to use multi-neck steel guitars (as well as different tunings on each neck, according to Brad’s Pages of Steel). “Steel Guitar Chimes” Leon McAuliff(e) 1958? “Steel Guitar Chimes” originally began life as a 78 released in 1938 by Roy Acuff And His Crazy Tennesseans, featuring the dobro work of Cousin Jody (née, James Clell Summey). Link to 7-minute video documentary, The Steel Guitar Rag Story with Leon McAuliffe. about the origins of Leon’s classic steel guitar instrumental. One question that will likely never get settled: is Leon’s surname spelled “McAuliff” (as it says on the album cover for Starday LP Swingin’ Western Strings of Leon McAuliff) or “McAuliffe” like it says most everywhere else? Thanks to the contributor of YouTube’s only audio clip of “Ode to Big Joe,” I now know which country singers are being affectionately parodied by The Willis Brothers in this song. Question: Can you close your eyes and identify the four country legends being spoofed? Answer: Hank Snow (the song’s narrator), Johnny Cash (the hummer), Ernest Tubb (Texan who sings a little flat) & Tex Ritter (the goofy one who falls asleep by line’s end). 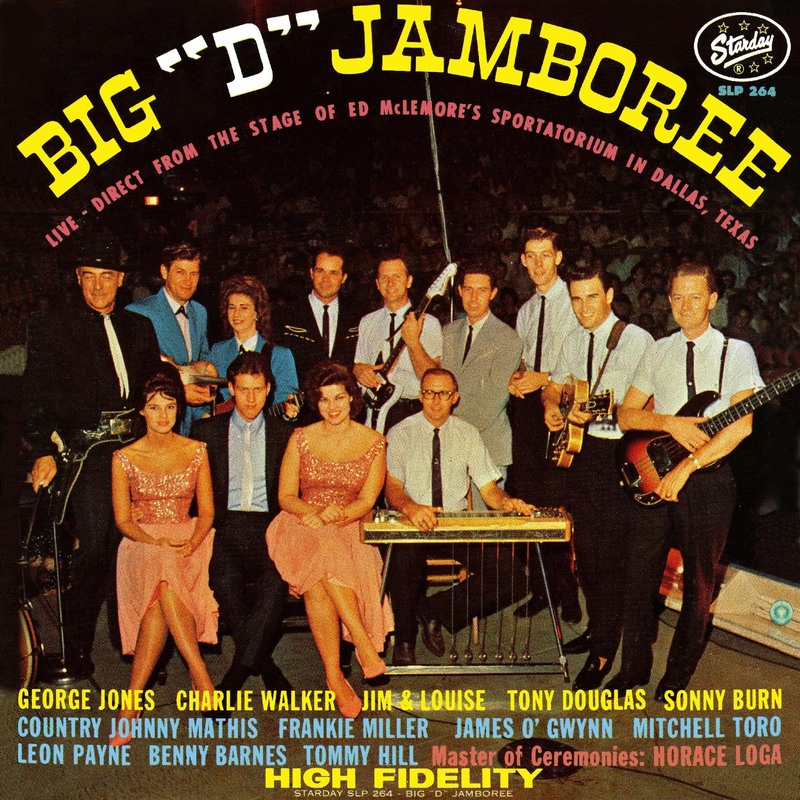 Written by Jack Clement (with truck driving classic, “Drivin’s in My Blood” on the flip side), “Ode to Big Joe” was released as a 45 at the top of 1968, a banner year – as noted earlier – for the musical trucking genre. “Ode to Big Joe” is a tongue-in-cheek tip of the hat to steel guitarist, Big Joe Talbot, who we last encountered at a 1955 overdubbing session for a 1930 Jimmie Rodgers flip-side. Key Question: Did Big Joe really – as The Willis Brothers sing – put the soap suds in the fountain at the Country Music Association in Music City USA? Joe Talbot, one of the Nashville entertainment industry’s last remaining champions of traditional country music, died yesterday at age 72. As a record manufacturer, song publisher, SESAC performance-rights executive and musician, Mr. Talbot contributed to the development of Music Row for more than 50 years. He was lifetime director, past board chairman and past president of the Country Music Association. He was also a past Board Chairman of the Country Music Foundation, which operates the Country Music Hall of Fame. Joe Talbot would have turned 73 today. Born in 1927, the Nashville native served in the Army in 1945-46. In 1950 he realized his youthful ambition by becoming the steel guitarist in the band of future Country Music Hall of Fame member Hank Snow. He performed on the Grand Ole Opry with Snow in 1951-52 and continued to tour and record with the superstar until 1954. During this same time, Mr. Talbot attended Vanderbilt University Law School, from which he graduated in 1952. He floundered in business for a number of years before establishing United Record Pressing in 1967. The company boomed as the manufacturer of vinyl discs for Elvis Presley and the million-selling Motown Records acts. In 1967 Mr. Talbot also became the manager of SESAC’s Nashville operations. SESAC is a performance rights organization similar to BMI and ASCAP. He remained there until 1971. Mr. Talbot’s other ventures have included Harbot Music in 1965-67. This company published the songs of Nashville Songwriters Hall of Fame member Ted Harris. He also owned a prominent Music Row office building. In 1991, Joe Talbot was recognized by the Nashville Entertainment Association with its Master Award. The honor represented the deep affection that the music community had for him, as well as his contributions to the creation of the Nashville show-business industry. Joe Talbot is the second of the CMA Lifetime Board members who has died, after Wesley Rose — the original five were Mr. Talbot, Mr. Rose, Bill Denny, Frances Preston and Ralph Peer Jr.
“Baby Rocked Her Dolly” was also covered by Starday labelmates, Frankie Miller (1960) and Red Sovine (1967). However, for his own version, Kilgore wisely decides to begin — just as George Martin did on “She Loves You” — with the chorus, and to great effect. “Baby Rocked Her Dolly” was included on Merle Kilgore’s 1963 Starday LP, There’s Gold in Them Thar Hills. Album produced by Jack Clement, who also wrote “Bob” – along with Vincent Matthews. Is it really true that “Bob” would serve double duty as both title track and B-side? Song title would be commandeered 36 years later by Weird Al for his brilliant Dylan spoof. Is it too much of a stretch to tag this piece as “Latin Soul” due to the use of mariachi horns throughout the song? With the input of guitar greats, Billy Byrd and Hank Garland, Gibson’s then-President, Ted McCarty, developed and debuted the Gibson Byrdland electric archtop guitar in 1955, three years before the better-known ES-335. Gibson.com points out that the Byrdland was reintroduced as a limited run in 1977, 1978 & 1992 – primarily as a result of the popularity of Ted Nugent, who himself wielded a Byrdland in tribute to Jimmy McCarty of Mitch Ryder & the Detroit Wheels. This musical roll call of fleet-fingered axe-pickers was recorded in 1958 and released on Starday in 7-inch as well as 12-inch form. If you’ve never seen Thumbs Carllile play, then you’re really in for a treat. As it turns out, Stanley Jordan wasn’t the first person to approach playing the guitar like a piano. Check out this exhilarating version of “Li’l Liza Jane” from Bill Wemberly & His Country Rhythm Boys, featuring the dual guitar wizardry of Thumbs Carllile and Curly Chalker from Red Foley’s “Ozark Jubilee” TV show. To find a live western swing recording, especially of this high fidelity, on a 1960s Starday compilation is a bit unusual. I would love to know if other instrumentals by The Golden West Cowboys are in the Starday vaults somewhere or have enjoyed release on other vinyl/tape offerings. It would appear I have a gaping hole in my Starday record collection. Also important to point out that this cassette was released sometime in the 1970s/80s after the Starday-King catalog had been sold to Moe Lytle’s Gusto Records. Lytle and his team would be the ones who could help identify the source of this live recording by Pee Wee King’s Golden West Cowboys. “Wildcat Run”: World’s Fastest Key Change? Q: Which country song changes keys quickest starting from 0:00? Note that the song starts in G Major – but only 27 seconds later the song has already shifted up to G-sharp Major. But wait, don’t get too comfortable just yet – only 25 more seconds will transpire and we will have modulated upward yet again to A Major. That’s two key changes in just 52 seconds. Even better – the entire song clocks in at a lean 80 seconds. Can anyone beat 27 seconds? “Wildcat Run” appears to have initially been released on the 1966 Starday truck driving album, Thunder on the Road.